I'd like to tell a few words about why comic pics can be dangerous. 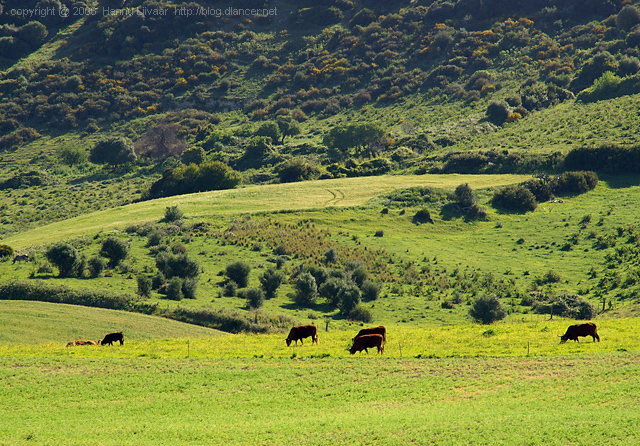 I'm sure you all already know a lot about it, but hey, I have to continiue by blog :) The pic with the cows stands for peace, it is taken in south-west Spain near Cadiz, which is a very beautiful district. I have more than 1,000 pics from my trip there from 2005, so you'll see a tons of them appearing here when I'm out of ideas/pics related with the article. You can click on the pic, for bigger size. I try make it a tradition from now on. in many of the muslim countries. I'm not able to understand that kind of things, because I'm not very educated (I haven't read the bible nor the koran), but there's an incident related to that all I'd like to share with you. One day while I was hanging around in orkut (oh holy internet, you are so great), I got a friend request from a guy from Algeria - seemed an interesting aquaintance for me, so I accepted it and we later talked a lot via msn. We had a lot of talk about - progressive rock (he's a real audiophile), global problems (why Kursk went down, why 9.11 happened, and so on, very interesting topics), why pakistanians are going to search a new life in UAE, and everyday's life. Well, I enjoyed these intelligent conversiations much, till one day he came online and asked: "man, what do you think about this danish cartoons?" well, as much as I know, religions is always extremely sensitive topic. But I love to say to my friends what I really think ( = I want to feel myself free while being with my friends), so after introducing my background him ( = that I do not know much about chrisitians' / muslims' values), I said that I personally do not care much about the pics in some secondary newspaper. So that was the end of the story, my answer angered him so much that I did not meet him online for many weeks. Geez, this religion has some power! I was thinking, and I was right. When I meet him later online again, we discussed about what has happened. I apologized and sayd I did not mean anything bad with saying what I said. No good. Religion was the most important thing for him, so today I do not have this contact anymore. So what I learned from this lesson? Uncountable list of things. First, never underestimate the power of religion. Second, that it is hard to discuss religion related issues with a seriously religious man in a neutral ground. .. and so on.